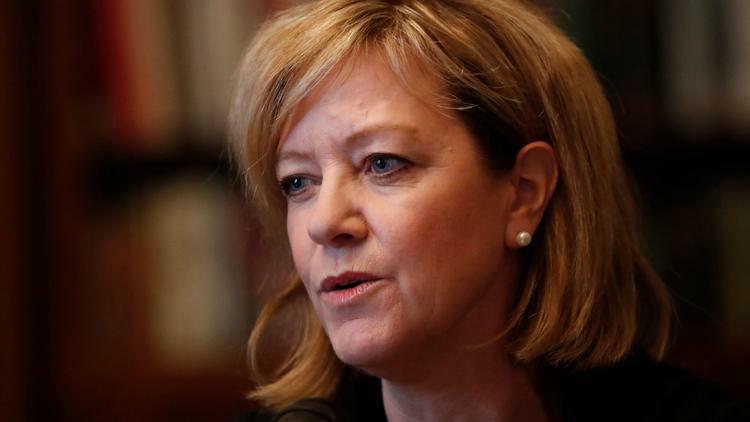 Republican governor challenger Jeanne Ives meets with the Chicago Tribune Editorial Board on Jan. 29, 2018. Ives canceled a fundraising speech Thursday by internet commentator Bill Whittle, who has been criticized over racially charged remarks. Republican governor challenger Rep. Jeanne Ives of Wheaton scheduled Bill Whittle to address a fundraiser Thursday in McHenry County. The Chicago Tribune reports her decision to cancel the speech came at the urging of state Senate GOP leader Bill Brady and other members of the legislature. In 2016, Whittle expressed support of a concept there is a correlation between IQ, race and crime, and places African-Americans at a lower level than whites. Ives' campaign said it was unaware of Whittle's previous remarks. Rauner campaign spokesman Will Allison said the controversy "just shows how unelectable Rep. Ives really is."